Serve Your Holiday Drinks on this. Mount a cheery hand stitched Holiday Greeting. Family Photos, a Vintage Doily or Embroidery. Matching Red mat, and glass are included. Easily mount your needlework, linen doily or photos. Remove 4 screws at end and slide out glass, mat, and back board. Insert can be changed for different Holidays & Occasions.. This wood serving tray is no longer available.. Serving Tray is from a private collection and in perfect condition. 12 1/2" x 19 1/2" outside measurement. 3 1/4 high at side handle. 1 3/4 high at side. Opening in mat is 15 1/2" x 8 1/2". 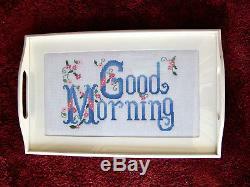 White Tray with "Good Morning" is example and is also available. Please inquire about white tray if interested. 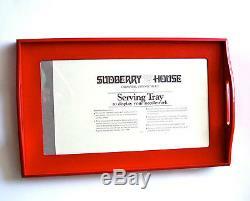 Serving tray is from smoke free - pet free environment. We are looking forward to, and promise to provide you with our excellent customer service.. 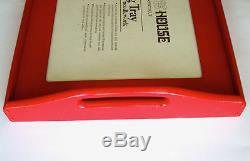 The item "Sudberry House Large Serving Tray, Wood Painted Red with Inset for Needlework" is in sale since Friday, December 7, 2018. This item is in the category "Crafts\Needlecrafts & Yarn\Embroidery & Cross Stitch\Hand Embroidery Cloth & Canvas\Plastic Canvas". The seller is "abeadifulpursen" and is located in Irvine, California. This item can be shipped to United States, Canada, United Kingdom, Denmark, Romania, Slovakia, Bulgaria, Czech republic, Finland, Hungary, Latvia, Lithuania, Malta, Estonia, Australia, Greece, Portugal, Cyprus, Slovenia, Japan, China, Sweden, South Korea, Indonesia, Taiwan, South africa, Thailand, Belgium, France, Hong Kong, Ireland, Netherlands, Poland, Spain, Italy, Germany, Austria, Bahamas, Israel, Mexico, New Zealand, Philippines, Singapore, Switzerland, Norway, Saudi arabia, Ukraine, United arab emirates, Qatar, Kuwait, Bahrain, Croatia, Malaysia, Brazil, Chile, Colombia, Costa rica, Dominican republic, Panama, Trinidad and tobago, Guatemala, El salvador, Honduras, Jamaica, Antigua and barbuda, Aruba, Belize, Dominica, Grenada, Saint kitts and nevis, Saint lucia, Montserrat, Turks and caicos islands, Barbados, Bangladesh, Bermuda, Brunei darussalam, Bolivia, Ecuador, Egypt, French guiana, Guernsey, Gibraltar, Guadeloupe, Iceland, Jersey, Jordan, Cambodia, Cayman islands, Liechtenstein, Sri lanka, Luxembourg, Monaco, Macao, Martinique, Maldives, Nicaragua, Oman, Peru, Pakistan, Paraguay, Reunion, Viet nam.